Geochemical Perspectives Letters - Cadmium isotope variations in Neoproterozoic carbonates - A tracer of biologic production? Hohl, S.V., Galer, S.J.G., Gamper, A., Becker, H. (2017) Cadmium isotope variations in Neoproterozoic carbonates - A tracer of biologic production? Geochem. Persp. Let. 3, 32-44. Figure 1 Isotope and concentration data from Xiaofenghe section. Samples are drawn in equidistance according to their sample numbers in Table 1 for better visibility. (a-c) Carbon isotope data. (d) Carbonate ε112/110Cd (error bars = 2σ), grey bar = discrimination line for modern seawater values (Ripperger et al., 2007). (e) Salinity-corrected ε112/110Cd of seawater. (f) Bulk δ15N, yellow envelope = 0.2 ‰ uncertainty, grey bar = modern surface water. (g,h) Shale-normalised Y/Ho and Ce/Ce* in carbonates, grey bars represents discrimination of modern seawater values (Bau et al., 1995) and negative/positive Ce anomalies. Table 1 Stable isotope data; N and C concentrations; assorted shale normalised REE ratios and Mn enrichments relative to Cal-S from Hohl et al. (2015b). D1-D4 = Doushantuo Fm., DG = Dengying Fm. 1 O and C isotopic data relative to VPDB; 2 Cd relative to NIST SRM 3108; 3 N relative to Air; 4 calculated following equations given by Lawrence and Kamber, 2006. Figure 2 (a) Mn vs. ε112/110Cd. Cap dolomites (open triangles) have high Mn concentrations and exhibit positive ε112/110Cd. (b) N vs. Cd isotopic compositions reveal negative trend. (c) Carbon vs. Cd isotopic compositions show slight positive correlation when extreme values (red squares) and cap dolomites are excluded. (d) Cd concentrations vs. ε112/110Cd values scatter along modern Southern ocean fractionation line (Abouchami et al., 2011), open circles represent coeval calculated ε112/110Cdsw; note that the seawater Cd concentrations cannot be estimated from those measured in the carbonates. Figure S-1 (a) Mn/Sr ratios are strongly elevated in the cap dolostones, presumably as a result of reducing pore-fluids, but show no correlation with Cd isotopic compositions. (b) K concentrations show a correlation with Cd isotope compositions in the Doushantuo IV member, however as in other members we do not report any dependency, as leaching of detrital minerals during the carbonate dissolution is considered negligible. 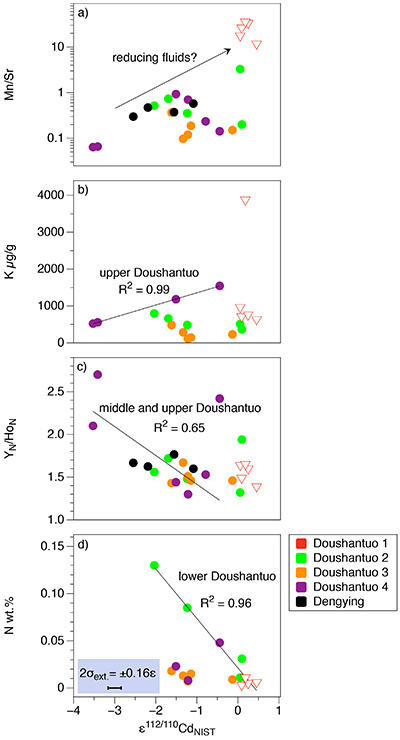 (c) Y/Ho ratios in middle and upper Doushantuo correlate with Cd isotopic compositions. (d) N concentrations in the lower Doushantuo may reflect loss of N during diagenesis. Figure S-2 BSD picture of a Xiaofenghe section cap dolostone at 2.35 m stratigraphic height. 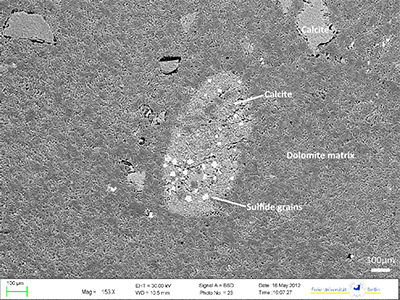 The sample shows calcitic fillings within a formerly porous dolomicritic matrix. Subhedral (10-40 µm diameter) authigenic sulphide grains are abundant in samples from the basal Doushantuo cap dolostones. Scale bar is 100 µm. Figure S-3 (a) Assuming that fractionation of Cd into carbonate phases is salinity controlled, we used Y/Ho ratios in acetic acid leachates as a record for salinity variations. In modern estuarine mixing environments shale normalised Y/Ho ratios vary from 0.97 for river water (RW) to 2.96 for seawater (SW) (Lawrence and Kamber, 2006), confirmed by similar Y/Ho ranges obtained by other authors (e.g., Bau and Dulski, 1995). We used these two values as end members for the calculation of the corrected Ediacaran Cd isotope curve (Fig. 1e). A general 5 % uncertainty (2 RSD) was applied on the trace element concentration data. 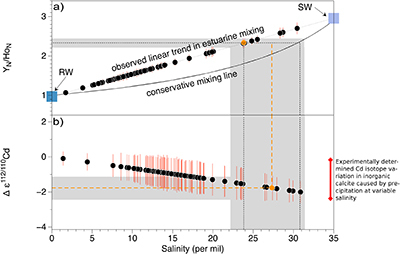 We calculated salinities for a case in which salinity and Y/Ho are linearly correlated (dotted line) and another case in which the correlation follows a conservative mixing line between the two end members (bold line). The average of the two cases (exemplified by the dashed orange line) was then used to calculate model salinity values. (b) From calculated salinities S we inferred ε112/110Cd shifts that result from Cd isotopic fractionation under variable salinity as shown experimentally by (Horner et al., 2011). Following their work, we assume a linear relationship between no shifts at S = 0 ‰ and a shift of -2.27 ε112/110Cd at S = 35 ‰ (αCaCO3–Cdaq = 0.9995773 ± 0.00006). Finally, with this information we were able to calculate a salinity independent ε112/110Cd curve of seawater that may have been in equilibrium with the carbonates at the time of their precipitation (Fig. 1e). Knoll, A.H. (2015) Life on a Young Planet: The First Three Billion Years of Evolution on Earth. Princeton University Press. Kaufman, A.J., Knoll, A.H. (1995) Neoproterozoic variations in the C-isotopic composition of seawater: stratigraphic and biogeochemical implications. Precambrian Research 73, 27–49. Halverson, G.P., Hurtgen, M.T. (2007) Ediacaran growth of the marine sulfate reservoir. Earth and Planetary Science Letters 263, 32–44. Planavsky, N., Bekker, A., Rouxel, O.J., Kamber, B., Hofmann, A., Knudsen, A., Lyons, T.W. (2010) Rare Earth Element and yttrium compositions of Archean and Paleoproterozoic Fe formations revisited: New perspectives on the significance and mechanisms of deposition. Geochimica et Cosmochimica Acta 74, 6387–6405. Yin, L., Zhu, M., Knoll, A.H., Yuan, X., Zhang, J., Hu, J. (2007) Doushantuo embryos preserved inside diapause egg cysts. Nature 446, 661–663. Xiao, S., McFadden, K.A., Peek, S., Kaufman, A.J., Zhou, C., Jiang, G., Hu, J. (2012) Integrated chemostratigraphy of the Doushantuo Formation at the northern Xiaofenghe section (Yangtze Gorges, South China) and its implication for Ediacaran stratigraphic correlation and ocean redox models. Precambrian Research 192–195, 125–141. Lacan, F., Francois, R., Ji, Y., Sherrel, R.M. (2006) Cadmium isotopic composition in the ocean. Geochimica et Cosmochimica Acta 70, 5104–5118. Ripperger, S., Rehkämper, M., Porcelli, D. (2007) Cadmium isotope fractionation in seawater - a signature of biological activity. Earth and Planetary Science Letters 261, 670-684. Abouchami, W., Galer, S.J.G., de Baar, H.J.W., Alderkamp, A.C., Middag, R., Laan, P., Feldmann, H., Andreae, M.O. (2011) Modulation of the Southern Ocean cadmium isotope signature by ocean circulation and primary productivity. Earth and Planetary Science Letters 305, 83–91. Schmitt, A.-D., Galer, S.J.G., Abouchami, W. (2009) Mass-dependent cadmium isotopic variations in nature with emphasis on the marine environment. Earth and Planetary Science Letters 277, 262–272. 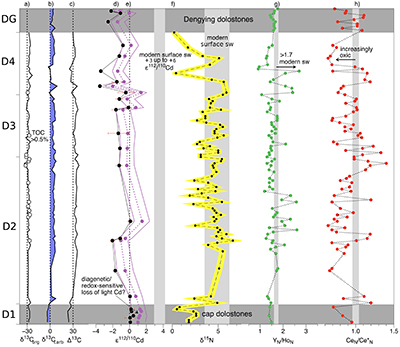 Horner, T.J., Schönbächler, M., Rehkämper, M., Nielsen, S.G., Williams, H., Halliday, A.N., Xue, Z., Hein, J.R. (2010) Ferromanganese crusts as archives of deep water Cd isotope compositions. Geochemistry, Geophysics, Geosystems 11, 1-10. Boyle, E.A., Sclater, F., Edmond, J.M. (1976) On the marine geochemistry of cadmium. Nature 263, 42–44. Price, N.M., Morel, F.M.M. (1990) Cadmium and cobalt substitution for zinc in a marine diatom. Nature 344, 658–660. Park, H., Song, B., Morel, F.M.M. (2007) Diversity of the cadmium‐containing carbonic anhydrase in marine diatoms and natural waters. Environmental Microbiology 9, 403–413.
) whose first appearance lies in the Mesozoic. Studying Cd systematics in Proterozoic sediments could therefore possibly provide insights into the lineage of the CA enzymes. It is equally possible that cadmium fulfills no biological role at all, in most cases, and that Cd uptake is driven by absorption onto organic matter or that Cd is pumped into the cell through the membrane, mistaken for Zn. Wasylenki, L.E., Swihart, J.W., Romaniello, S.J. (2014) Cadmium isotope fractionation during adsorption to Mn oxyhydroxide at low and high ionic strength. Geochimica et Cosmochimica Acta 140, 212-226. Horner, T.J., Rickaby, R.E.M., Henderson G.M. (2011) Isotopic fractionation of cadmium into calcite. Earth and Planetary Science Letters 312, 243–253.
) and biological utilisation are known to favour the light isotopes, which would all be consistent with the observation of heavy Cd in surface seawaters. But irrespective of these uncertainties concerning the reason for uptake and site of fractionation, Cd isotopes can be used as a convincing proxy for productivity in surface waters in the sense that the greater the depletion in Cd (and macronutrients like phosphate), the isotopically heavier the Cd becomes that is left behind in seawater. Georgiev, S.V., Horner, T.J., Stein, H.J., Hannah, J.L., Bingen, B., Rehkämper, M. (2015) Cadmium isotopic evidence for increasing primary productivity during the Late Permian anoxic event. Earth and Planetary Science Letters 410, 84–96. Ader, M., Sansjofre, P., Halverson, G.P., Busigny, V., Trindade, R.I.F., Kunzmann, M., Nogueira, A.C.R. (2014) Ocean redox structure across the Late Neoproterozoic Oxygenation Event: A nitrogen isotope perspective. 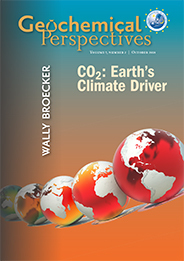 Earth and Planetary Science Letters 396, 1–13. Bebout, G.E., Fogel, M.L. (1992) Nitrogen-isotope compositions of metasedimentary rocks in the Catalina Schist, California: Implications for metamorphic devolatilization history. Geochimica et Cosmochimica Acta 56, 2839–2849. ), combining with Cd isotopes is potentially useful in screening such datasets. Nevertheless, when analysing Cd isotopes in ancient sediments, other factors that may mask the true seawater signal must be carefully evaluated, such as fluid flow alteration and additional inorganic fractionation processes (e.g., variable salinity, authigenic sulphide precipitation). ; detailed analytical protocols in Supplementary Information). Ishikawa, T., Ueno, Y., Shu, D., Li, Y., Han, J., Guo, J. (2013) The δ13C excursions spanning the Cambrian explosion to the Canglangpuian mass extinction in the Three Gorges area, South China. Gondwana Research 25, 1045-1056. Canfield, D.E., Glazer, A.N., Falkowski, P.G. (2010) The evolution and future of earth’s nitrogen cycle. Science 330, 192–196. ); however, smaller second-order variations in the δ15N curve might simply be due to alteration. Bau, M., Dulski, P., Möller, P. (1995) Yttrium and holmium in South Pacific seawater: vertical distribution and possible fractionation mechanisms. Oceanographic Literature Review 42, 955.
) and negative/positive Ce anomalies. Table 1 Stable isotope data; N and C concentrations; assorted shale normalised REE ratios and Mn enrichments relative to Cal-S from Hohl et al. (2015) Hohl, S.V., Becker, H., Gamper, A., Jiang, S.-Y., Wiechert, U., Yang, J.-H., Wei, H.-Z. (2015) Secular changes of water chemistry in shallow-water Ediacaran ocean: Evidence from carbonates at Xiaofenghe, Three Gorges area, Yangtze Platform, South China. Precambrian Research 270, 50–79. . D1-D4 = Doushantuo Fm., DG = Dengying Fm. 1 O and C isotopic data relative to VPDB; 2 Cd relative to NIST SRM 3108; 3 N relative to Air; 4 calculated following equations given by Lawrence and Kamber, 2006 Lawrence, M.G., Kamber, B.S. (2006) The behaviour of the rare earth elements during estuarine mixing—revisited. Marine Chemistry 100, 147–161. .
Hohl, S.V., Becker, H., Gamper, A., Jiang, S.-Y., Wiechert, U., Yang, J.-H., Wei, H.-Z. (2015) Secular changes of water chemistry in shallow-water Ediacaran ocean: Evidence from carbonates at Xiaofenghe, Three Gorges area, Yangtze Platform, South China. Precambrian Research 270, 50–79. Brand, U., Veizer, J. (1980) Chemical diagenesis of a multicomponent carbonate system-1: trace elements. Journal of Sedimentary Petrology 50, 1219-1236. ), open circles represent coeval calculated ε112/110Cdsw; note that the seawater Cd concentrations cannot be estimated from those measured in the carbonates. As has been discussed above, there is still no consensus as to why cadmium is taken up by phytoplankton in the surface ocean, nor at which step (or steps) in this process the isotope fractionation takes place. Nevertheless, it is clear that ε112/110Cd is a good indicator of biological productivity in the modern surface ocean: Cd uptake into OM leads to a depletion of light Cd in the photic zone. But can Cd isotopes in a marine sedimentary archive be used as a palaeo-productivity proxy? 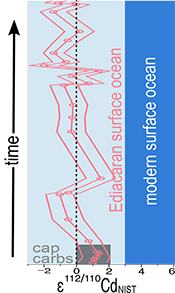 Under closed-system conditions (e.g., a restricted basin) Ediacaran carbonates precipitating in biologically productive environments would be expected to have higher (heavier) ε112/110Cd and δ13Ccarb. The Xiaofenghe carbonates do exhibit a positive correlation between ε112/110Cd and δ13Ccarb (Fig. 2c), consistent with increasing bio-productivity. However, this correlation only exists once light δ13Ccarb values from the basal Doushantuo (oxidation of a 12C-enriched hydrocarbon source) and one sample with extremely heavy δ13Ccarb of +9 (presumably due to evaporation) are excluded. Sachs, J.P., Repeta, D.J. (1999) Oligotrophy and Nitrogen Fixation During Eastern Mediterranean Sapropel Events. Science 286, 2845-2488. Struck, U., Pollehne, F., Bauerfeind, E., Bodungen, von B. (2004) Sources of nitrogen for the vertical particle flux in the Gotland Sea (Baltic Proper) - results from sediment trap studies. Journal of Marine Systems 45, 91–101. has highlighted the redox control on Cd distribution in late Permian marine sediments. Cd is a not a redox-sensitive element per se, but Cd bound to OM will become enriched in anoxic sediments whenever oxidation of OM is inhibited. Framson, P.E., Leckie, J.O. (1978) Limits of coprecipitation of cadmium and ferrous sulfides. Environmental Science and Technology 12, 465–469. Lewis, B.L., Landing, W.M. (1992) The investigation of dissolved and suspended-particulate trace metal fractionation in the Black Sea. Marine Chemistry 40, 105-141. Wen, H., Zhu, C., Zhang, Y., Cloquet, C., Fan, H., Fu, S. (2016) Zn/Cd ratios and cadmium isotope evidence for the classification of lead-zinc deposits. Scientific Reports 6, 25273, doi: 10.1038 /srep25273. Yang, J., Li, Y., Liu, S., Tian, H., Chen, C., Liu., J., Shi, Y. (2015) Theoretical calculations of Cd isotope fractionation in hydrothermal fluids. Chemical Geology 391, 74-82. Rolison, J.M., Stirling, C.H., George, E., Middag, R., Gault-Ringold, M., Rijkenberg, M.J.A., de Baar, H.J.W. (2015) Biogeochemical cycling of the uranium, iron and cadmium isotope systems during oceanic anoxia: A case study of the Black Sea. 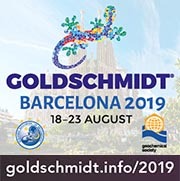 Goldschmidt Abstracts 2015, 2671.
did not find the high ε112/110Cd in the deeper parts of the Black Sea water column that one would expect. All in all this means that sulphide-bearing anoxic sediments should most likely have higher Cd concentrations and more negative ε112/110Cd than those of oxic surface waters. Thomson, J., Higgs, N.C., Jarvis, I., Hydes, D.J. (1986) The behaviour of manganese in Atlantic carbonate sediments. Geochimica et Cosmochimica Acta 50, 1807–1818. ). The cap dolomites exhibit Mn enrichments, more positive ε112/110Cd and low Cd concentrations. Furthermore, sedimentary sulphides ranging from 10 to 40 µm in size are abundant in thin section (see Fig. S-2). The fact that Ce anomalies are negative (Ce/Ce* < 0.9) in shallow Yangtze Platform cap dolomites (Fig. 1h) suggests that early Ediacaran surface-waters were already oxic; nonetheless, pore-waters may still have been anoxic, leading to the formation of sulphides and Mn-rich carbonates. In summary, incorporation of light Cd into sulphides may raise ε112/110Cd in associated carbonates, and might have affected the Xiaofenghe cap dolomites. , may account for the observed variation. The correlation between Y/Ho and ε112/110Cd (see Fig. 1g and Fig. S-1c) may therefore be due to an increased riverine input, flattening the REE patterns, decreasing the total salinity and thus reducing the isotopic fractionation into calcite. Any further increase in riverine input would most likely drown out any potential biological signal in the stable isotope proxies, such as ε112/110Cd, which would then resemble typical crustal values. Stable Cd isotopic compositions of Ediacaran-age carbonates from the Xiaofenghe section on the Yangtze Platform show significant variations of up to four ε112/110Cd units. There are several possible reasons for these variations: part of the signal may be biological in origin while abiological (inorganic) processes almost certainly play a role as well. Factors controlling the Cd isotopic compositions may include fluid flow alteration, the precipitation of authigenic sulphides under anoxic pore water conditions, both processes possibly modifying ε112/110Cd in the cap dolomites; additionally there are changes in Cd isotope fractionation into calcite as a function of salinity, as suggested here for the upper Doushantuo. Encouragingly, our salinity-corrected palaeo-seawater ε112/110Cdsw signals overlap those of modern surface waters. A positive correlation between δ13Ccarb and ε112/110Cd is observed, which suggests that the Cd isotope fractionation might, in part, have a biological origin, meaning that phytoplankton were present as early as the Ediacaran. Future research on marine sediments will need to address the abiotic fractionation processes above, and correct for them, in order to arrive at any biologically-derived Cd isotope signal present. This work was funded as part of DFG Research Group FOR-736 “The Precambrian-Cambrian Biosphere Revolution” (Subproject Be 1820/4-2). We thank Reimund Jotter and Wafa Abouchami at MPIC for discussions and their support in the lab, and members of FOR-736 who helped in sampling. We acknowledge helpful comments by Michael Tatzel, two anonymous reviewers and the editor, Helen Williams. Stable isotope fractionation of Cd is a new proxy for studying biogeochemical cycling of micronutrients in the present-day oceans (Lacan et al., 2006; Ripperger et al., 2007; Abouchami et al., 2011) and in sedimentary archives, such as Fe-Mn crusts (Schmitt, et al., 2009; Horner et al., 2010). The surface depletions in Cd are associated with “heavier” Cd stable isotopic compositions, which are thought to be due to preferential uptake of the “lighter” isotopes during incorporation of Cd by phytoplankton (Lacan et al., 2006; Ripperger et al., 2007; Abouchami et al., 2011). Stable Cd isotope compositions on acetic acid leachates from alteration-free carbonates were determined using a double-spike method and TIMS (see Schmitt et al., 2009; Abouchami et al., 2011; detailed analytical protocols in Supplementary Information). Figure 2 [...] (d) Cd concentrations vs. ε112/110Cd values scatter along modern Southern ocean fractionation line (Abouchami et al., 2011), open circles represent coeval calculated ε112/110Cdsw; note that the seawater Cd concentrations cannot be estimated from those measured in the carbonates. The resulting ε112/110Cdsw range between -2 and +1.5 (Fig. 1e), which is still slightly lower than the lower bound of modern surface seawater ε112/110Cd but scatter around the Rayleigh fractionation line defined by modern Southern Ocean seawaters (Abouchami et al., 2011; Fig. 2d). In recent years, δ15N has provided important insights into palaeo-ocean nutrient-cycling and redox conditions (Ader et al., 2014). In the cap dolostones δ13Corg and δ13Ccarb are decoupled (Δ13C = 25 vs. 33 in overlying strata, Fig. 1c) and this is mimicked in a shift in average bulk δ15N values from +1.6 ‰ to +4.2 ‰ (Fig. 1f), possibly indicating a change in the nutrient regime to a NO3--dominated marine environment (Ader et al., 2014). Figure 1 [...] (g,h) Shale-normalised Y/Ho and Ce/Ce* in carbonates, grey bars represents discrimination of modern seawater values (Bau et al., 1995) and negative/positive Ce anomalies. Seawater profiles of Cd show a nutrient-like behaviour, with strong near-surface depletions and deep-water enrichments, mimicking profiles of macronutrient phosphate (Boyle et al., 1976). In the cap dolostones ε112/110Cd > 0, while low Cd and N concentrations (Fig. S-1d) correlate with light δ13Ccarb (Fig. 1c) and high Mn/Sr ratios (see Fig. S-1a), commonly used as indicators of fluid overprinting (Brand and Veizer, 1980). This may possibly be attributable to increased oxygen availability, which is essential for organic matter (OM) remineralisation via nitrification-denitrification (Canfield et al., 2010); however, smaller second-order variations in the δ15N curve might simply be due to alteration. Cadmium may also be co-precipitated with sulphides under euxinic conditions (Framson and Leckie, 1978), such as prevail in the deeper parts of the Black Sea today, where Cd is removed almost quantitatively from the water column and enriched in bottom sediments (Lewis and Landing, 1992). So far the oldest sediments analysed for their Cd isotopic compositions are Permian in age (Georgiev et al., 2015). Cyanobacteria blooms of this sort are often documented from redox-stratified basins (Struck et al., 2004), and recent work by Georgiev et al. (2015) has highlighted the redox control on Cd distribution in late Permian marine sediments. The oceans underwent some of the most remarkable transformations in Earth’s history in the Neoproterozoic, such as the appearance of animal life (Knoll, 2015), major excursions in sulphur and carbon isotope records (Kaufman and Knoll, 1995; Halverson and Hurtgen, 2007) and indications of a transition from an anoxic to a partially oxygenated deeper ocean in the aftermath of the Marinoan glaciation (Planavsky et al., 2010). Pure inorganic absorption (Wasylenki et al., 2014), partitioning into calcite (Horner et al., 2011) and biological utilisation are known to favour the light isotopes, which would all be consistent with the observation of heavy Cd in surface seawaters. Experiments on precipitation of inorganic calcite from seawater by Horner et al. (2011) show that the seawater/calcite fractionation factor for Cd is insensitive to temperature, Mg concentration and precipitation rate. Since these experiments by Horner et al. (2011) used only seawater and freshwater end-members, we will assume to first order that Cd isotope fractionation into calcite depends linearly on salinity. Table 1 Stable isotope data; N and C concentrations; assorted shale normalised REE ratios and Mn enrichments relative to Cal-S from Hohl et al. (2015). D1-D4 = Doushantuo Fm., DG = Dengying Fm. However, Hohl et al. (2015) have shown that, with the exception of the cap dolostones, carbonates at Xiaofenghe were not much affected by fluids (SEM pre-screening, no co-variation of δ18O with 87Sr/86Sr or Mn/Sr); thus, their trace element budgets and isotopic compositions most likely reflect partitioning and incorporation from Ediacaran seawater. If the Cd isotopic variations observed are controlled by changes in seawater salinity at the Xiaofenghe depositional site, estuarine mixing of seawater and river water, as described in Hohl et al. (2015), may account for the observed variation. These values are characteristic of enhanced planktonic productivity and remineralisation and resemble previously published data from the Doushantuo (e.g., Ishikawa et al., 2013). Lawrence, M.G., Kamber, B.S. (2006) The behaviour of the rare earth elements during estuarine mixing—revisited. Marine Chemistry 100, 147–161. Table 1 [...] 1 O and C isotopic data relative to VPDB; 2 Cd relative to NIST SRM 3108; 3 N relative to Air; 4 calculated following equations given by Lawrence and Kamber, 2006. Under zinc-poor conditions, Cd can substitute for Zn in Zn-CA and, furthermore, Price and Morel (1990) have described a cadmium-bearing carbonic anhydrase variant (Cd-CA) with the same functionality; but Cd-CA is only known from a few diatom species (Park et al., 2007) whose first appearance lies in the Mesozoic. Figure 1 [...] (d) Carbonate ε112/110Cd (error bars = 2σ), grey bar = discrimination line for modern seawater values (Ripperger et al., 2007). On the other hand, Rolison et al. (2015) did not find the high ε112/110Cd in the deeper parts of the Black Sea water column that one would expect. This trend would be consistent with strong N2 fixation by diazotrophs in the euphotic zone (Sachs and Repeta, 1999). Cadmium isotope data on hydrothermal sulphide ores (Schmitt, et al., 2009; Wen et al., 2016) and quantum chemical calculations (Yang et al., 2015) suggest that the light isotopes of Cd would be preferentially bound into the sulphide phase. As Mn in oxic waters is usually incorporated into Mn oxy-hydroxides, such enrichments are likely to reflect reduction of Mn to the 2+ state at the anoxic pore-water sediment interface and subsequent incorporation into CaCO3 (Thomson et al., 1986). To test this, we analysed shallow-water carbonates from the Ediacaran Xiaofenghe section that was deposited on the S-SE-facing passive margin of the Yangtze Craton and hosts abundant fossil assemblages of multicellular life from the Doushantuo and Dengying Formations (Xiao et al., 2012). These changes can arguably be best studied in marine sediments from the Yangtze Platform, South China, that cover the critical time span from the Cryogenian to the Precambrian-Cambrian (PCC) boundary which saw the appearance of the first macroscopic fossils (e.g., Yin et al., 2007). The Xiaofenghe section was sampled in detail with the aim of determining the geochemical variations in carbonate sediments and to study the role of alteration and preservation of primary compositions. The samples were carefully selected in the field and later pre-screened using a petrographic microscope and SEM to avoid samples with alteration structures, such as calcitic veins or weathering fronts. The samples were then cleaned with deionised water and powdered. Major and trace element compositions of acetic acid leachates and Sr-Nd-Ccarb-Ocarb isotopic compositions have been reported in Hohl et al. (2015). Stable isotope ratios and concentrations of nitrogen and organic carbon were obtained using a Thermo-Finnigan MAT V isotope ratio mass spectrometer coupled to a Thermo Flash EA 1112 elemental analyser via a Thermo/Finnigan Conflo III-interface at the Museum für Naturkunde in Berlin. δ15N analyses were performed on the bulk rock powder whereas for δ13Corg measurements, sample powders were decalcified before analysis using 2 M HCl. Isotope ratios are expressed in the conventional delta notation relative to AIR (nitrogen) and the V-PDB (Vienna PeeDee Belemnite) standard (carbon), respectively. The standard deviation for repeated measurements of a laboratory standard material (peptone) is generally better than 0.2 ‰ for both isotopic systems. After sample combustion, a CO2 trap was used to reduce interferences between bulk rock nitrogen and carbon isotope signals. Stable Cd isotope analyses were undertaken on leachates of the carbonate fraction so as to avoid any detrital material. We reacted 1 g of sample powder in pre-cleaned 50 mL centrifuge tubes with 50 mL of 1 M acetic acid-ammonium acetate buffer (pH = 5) at room temperature under continuous rotation overnight. The solution was centrifuged and the supernatant pipetted out. Aliquots of the leachate containing ~100 ng Cd were taken and optimal amounts of 106Cd-108Cd double-spike solution added, as described in Schmitt et al. (2009). After equilibration with the spike, 0.6 mL of 8.5 M HBr per 10 mL sample solution was added to obtain a concentration of ~0.5 N HBr. The Cd separation and purification used a two-step procedure: first, the solutions containing Cd were passed through BioRad Polyprep columns filled with 200 µL of BioRad AG1-X8 anion-exchange resin (100-200 mesh) in nitrate form to retain the Cd. The resin was rinsed repeatedly with 1 N HCl (to remove traces of bromide and matrix) followed by elution of the Cd with 0.25 N HNO3. For purification, the Cd eluted was again acidified to ~0.5 N HBr and passed a second time through the column. The samples were then loaded onto single Re filaments, covered with 1 µL silica gel-phosphoric acid activator and dried. Cadmium isotopic compositions were measured on a Triton (ThermoFisher) Thermal Ionisation Mass Spectrometer (TIMS) at the Max-Planck-Institut für Chemie in Mainz operating in static multi-collection mode. Running temperatures were ~1150 °C. Data reduction for the natural and instrumental mass-dependent isotope fractionation used the double-spike algorithm assuming an exponential fractionation law; the statistical uncertainties are based on reducing each measurement cycle (8 seconds) during the run. The 106Cd–108Cd double spike was originally calibrated against an in-house JMC Cd Plasma solution (Lot: 15922032), assuming 110Cd/112Cd = 0.520089 (Rosman et al., 1980) for unspiked cadmium. As reference material (RM) for “zero delta” we used the NIST SRM 3108 Cd standard (Lot: 130116), measured absolutely as 110Cd/112Cd = 0.520121 ± 0.000004 (Abouchami et al., 2012). The long-term external reproducibility on ε112/110Cd is ±0.16 ε unit at the 2s level (2 SD). Cadmium concentrations were obtained by isotope dilution from the bias-corrected 106Cd/112Cd and have analytical uncertainties of less than 0.1 % (2 RSD). Abouchami, W., Galer, S.J.G., Horner, T.J., Rehkämper, M., Wombacher, F., Xue, Z. (2012) A Common Reference Material for Cadmium Isotope Studies - NIST SRM 3108. Geostandards and Geoanalytical Research 37, 5–17. Bau, M., Dulski, P. (1995) Comparative study of yttrium and rare-earth element behaviours in fluorine-rich hydrothermal fluids. Contributions to Mineralogy and Petrology 119, 213–223. Horner, T.J., Rickaby, R.E.M., Henderson, G.M. (2011) Isotopic fractionation of cadmium into calcite. Earth and Planetary Science Letters 312, 243–253. Rosman, K.J.R., De Laeter, J.R., Gorton, M.P. (1980) Cadmium isotope fractionation in fractions of two H3 chondrites. Earth and Planetary Science Letters 48, 166–170. Schmitt, A.-D., Galer, S.J.G., Abouchami, W. (2009) High-precision cadmium stable isotope measurements by double spike thermal ionisation mass spectrometry. Journal of Analytical Atomic Spectrometry 24, 1079.